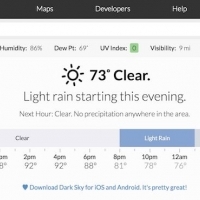 Dark Sky has gained an optional Dark Mode in the latest version of the hyperlocal weather app for iOS. 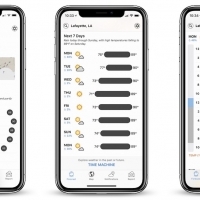 The update means users can check weather information in the app with white text on a dark background, a new design that's supposed to be easier on the eyes in dimly lit environments. In addition, Dark Sky v6.2 also gains an optional Daylight mode that automatically enables the black interface when the sun goes down. The new settings can be accessed by tapping the cog wheel icon in the top-right of Dark Sky's main screen, where a new Appearance menu lets users select from Light, Dark, or Daylight. 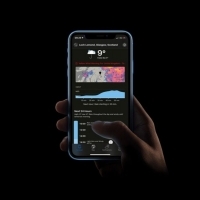 Dark Mode is becoming increasingly popular in smartphone apps, and iOS 13 will reportedly include a system-wide dark mode to match the dark mode that was first introduced on Mac with macOS Mojave. The upcoming setting will allow for "easier nighttime viewing," according to Bloomberg. Dark Sky users on iOS can get the new update for free starting today, and those who haven't downloaded the app yet can do so for $3.99 [Direct Link].